I Guage. This equipment is suitable for dynamics experiment of sphere (ball) rolling down the track with BeeSpi V attached as velocity measuring gates for the sphere. Relationship of impact force to an object and height/speed/weight. 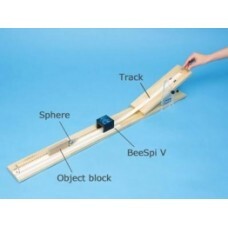 The angle of the slope is adjustable from 0-45 degrees (measured by a protractor on the side of the track). The scale besides the track, enables you to measure the distance of objects moved by the impact.